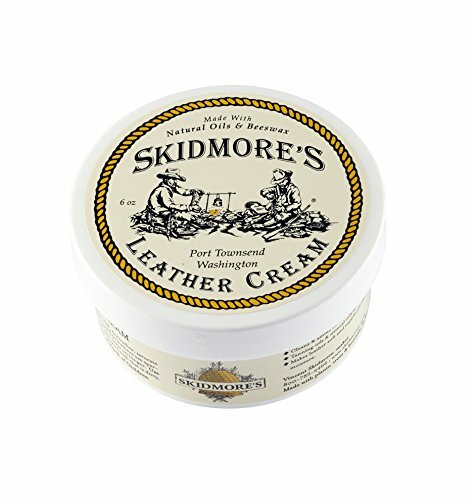 Skidmore’s Leather Cream is an all purpose leather care kit which cleans, conditions, and protects all types of leather. Regular use will build a degree of waterproofing on the leather. Use on saddles, tack, chaps, shoes & boots, purses, motorcycle leathers, saddlebags, car upholstery, and leather furniture. First apply to a small corner of your item, let sit, and buff off to make sure you love the results. Can apply multiple coatings to enhance the effects.CLEAN, RESTORE, AND CONDITION LEATHER – Cleaner wipes on to remove a scratch and repair dry leather. REAL RESULTS – Cream will melt deeply into leather and oil will set deep into material quickly. CHEMICAL-FREE CONDITIONER – Effective on a leather briefcase, band, belt, strap, wallet, and more! MADE IN USA – Handmade product engineered in Pacific Northwest by small family business since 1982.